When I was a little girl, I devoured all kinds of historical fiction, and when the novels didn’t tell me enough I went to the history section, checking out heavy dusty tomes to further dig into what details there were. During one rather long period, I was stuck in the English Civil War, with my heart firmly in the Royalist camp. Today, I am still stuck in the Civil War – or rather its aftermath, as I have a particular fondness for the latter half of the seventeenth century, but these days I root for the Parliamentarians. Always. A somewhat fruitless position one could argue, given that ultimately Charles II was reinstated, but there you are. As we all know, the Restoration as such was a bloodless event. The returning king was wise enough not to demand redress for years of exile and penury, nor did he actively persecute former Parliamentarians – well, with one exception, the regicides. Fifty-nine commissioners signed Charles I death sentence, and of these twenty were already dead when Charles II ascended the throne, nineteen were imprisoned for life, three were disinterred and executed “after the fact” so to say, and nine were hung, drawn and quartered. George Downing spent his childhood in England, but accompanied his family to Massachusetts when he was fifteen. He was in the first class ever to graduate from Harvard, spent some time in the West Indies and subsequently ended up as a chaplain in a regiment commanded by one John Okey. The coming years had George seeing very much fighting first hand, and through a series of advantageous career moves plus, one must assume, considerable skills, he advanced steadily from spymaster all the way to one of Cromwell’s most trusted diplomats. So far, George had been a steadfast supporter of the Commonwealth cause. 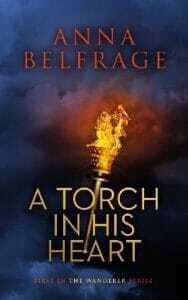 His whole career had been built on his staunch Puritan convictions and his loyalty to the Protector. Unfortunately for George, Oliver Cromwell went and died in 1658. Fortunately for George, at the time he was the English ambassador to the Netherlands and managed to cling on to this post throughout the eighteen months of turmoil that followed on Cromwell’s death. And while he was at it, dear George took the opportunity to mend his fences with Charles Stuart – also in the Netherlands – expressing that his life so far was a lie, built on the erroneous principles that had been inculcated in him during his years in the radical Colonies. I’m not sure Charles bought this “volte-face”. I do, however, believe that Charles Stuart had learnt the hard way how important it was to surround himself with capable men, and George Downing was nothing if not impressively capable. A tenuous relationship was established, resulting in George still being the ambassador to the Netherlands when Charles set off to claim his throne. There were a number of people in Charles’ inner circle that were anything but thrilled by this development, and somehow George needed to quench all doubts as to where his loyalty lay. (A sarcastic person would conclude he was mostly loyal to his own interests rather than to his professed convictions …) A golden opportunity to do so arose in early spring of 1662. After several years as a spymaster and an ambassador, George had a number of spies in his service, one of whom lived in Delft and was called Abraham Kick. How unfortunate for the three regicides, Barkstead, Corby and Okey – yupp, George’s former commanding officer – that they used Kick as their contact when fleeing the long arm of royal justice. But George, well he must have rubbed his hands together in glee at this most happy turn of events. John Okey, an unfortunate man! The Dutch were ambivalent to the new English king, and were on the whole very sympathetic to Puritans fleeing England for their land. George couldn’t risk such sensitivities getting in the way of his plan, and once he had a warrant for their arrest, he set off to do the actual arresting on his own, with people he could trust. Night was closing in when George and his men burst into Kick’s house. I wonder what he said to Okey, if he could look these former comrades of his in the eyes when by his actions he was effectively condemning them to gruesome death. Whatever the case, he had the three regicides dragged off to Delft’s town jail and set about organising the logistics of transporting them back to England and the waiting gallows. The people of Delft were not pleased by George’s nightly raid. The magistrates demanded that the three unfortunates should have their case tried, and public opinion was loud in their support. For a while there it seemed this most juicy plum was about to be plucked from George’s hand, but resourceful as ever he secured a handover document at lightning speed from the powers that were. 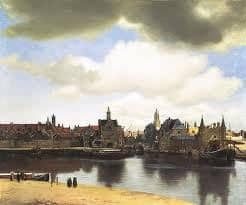 Imagine a cold March dawn in seventeenth century Delft. Mists hung like sheer veils over the network of narrow canals, and this early there were no lights, no sounds but the occasional bark of a dog. A soft splash, a muted curse, and a small boat appeared through the fog, rowed up the canal that lead to the back entrance of the jail. In the prow sat George with his precious document, and minutes later three bound men were bundled into the boat, muted screams leaking through their gags. Well before sunrise the boat had left Delft far behind and some days later Downing’s precious cargo was deposited on English soil. In April 1662, Barkstead, Okey and Corby were hung, drawn and quartered. 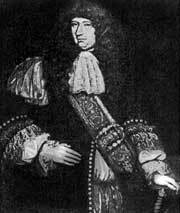 In July of 1663, Downing was made a baronet, dying a couple of decades later as a very wealthy man. But now and then I suspect it came back to haunt him, that day when he arrested those three men. Did he twist in bed as he recalled Okey’s frenzied pleading that he please not do this? Did he sometimes shiver awake in the predawn, convinced that it was Okey’s hand that clutched at his neck? I somehow hope he did. He could have let them run. He chose not to. As you may have gathered by now, I am somewhat fascinated by men with convictions. This is why my hero, Matthew Graham, is a Scots Covenanter who still holds to his vows, no matter who governs the land. At times this makes his wife, Alex, groan out loud. But what would she know of religious fortitude, how can she truly understand this man of hers when she was born in 1976? Yup; 1976, and as Alex herself will tell you, it is all “bloody unbelievable”.